If someone says to you ‘island hopping’, it can be easy to let your mind wander to the furthest regions of the world and forget the magnificent range of islands in Europe that are waiting to be explored. From tranquil and serene escapes to vibrant retreats overflowing with activities and entertainment opportunities, there is an island hopping holiday to suit you. By combining two luxury hotels, on two exotic islands, into one trip, you can get more out of your holiday. Our personalised luxury holidays make island hopping in Europe easy and stress free. While we make all the arrangements, you can relax safe in the knowledge everything is taken care of. Below we have put together some taster island hopping itineraries in Greece, Spain, Italy and Croatia, to illustrate the outstanding island hopping opportunities awaiting you in Europe; feel free to alter the elements of these itineraries, such as the length of time spent at each hotel or the board basis. 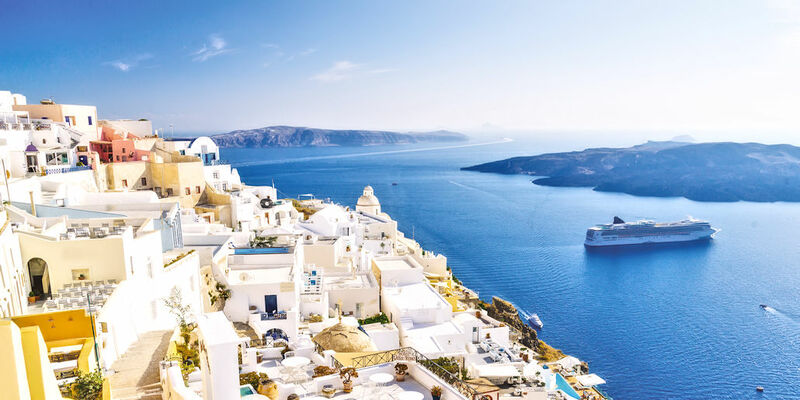 With deep blue waters every way you turn, romantic whitewashed houses along with a traditional and laidback way of life, it’s easy to see why the Greek islands have such allure. Island hopping in Greece is a magical way to experience the islands, bringing together a feeling of freedom, a spirit of adventure and the excitement of making new discoveries. The smallest of the Sporades islands, Skiathos is just 12km by 6km and is easily explored by bus or boat. 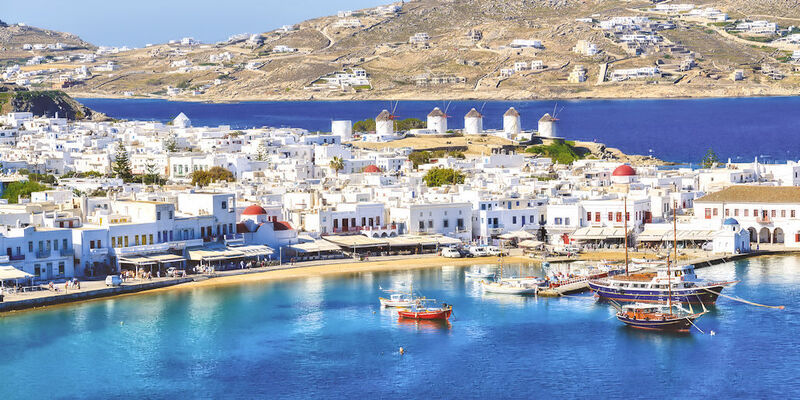 As with many Greek islands, you’ll find friendly tavernas and whitewashed houses lining the quaint, narrow streets, and there are water sports aplenty on the beaches. Approximately 1.5 hours ferry transfer and you’re onto the next island, Alonissos. Lesser developed, this island boasts an unspoilt natural beauty, with numerous marked walking trails making it easy for visitors to explore by foot. Staying at Marpunta Village Club, you’ll also have access to a pebble beach and beach bar, and there’s a complimentary shuttle to the port area. Famed for its rich culture and religious history, the island holds a myriad of attractions for visitors to enjoy. A variety of churches and monasteries, dating back to the Byzantine and Venetian period of occupation, can be found scattered across the island. 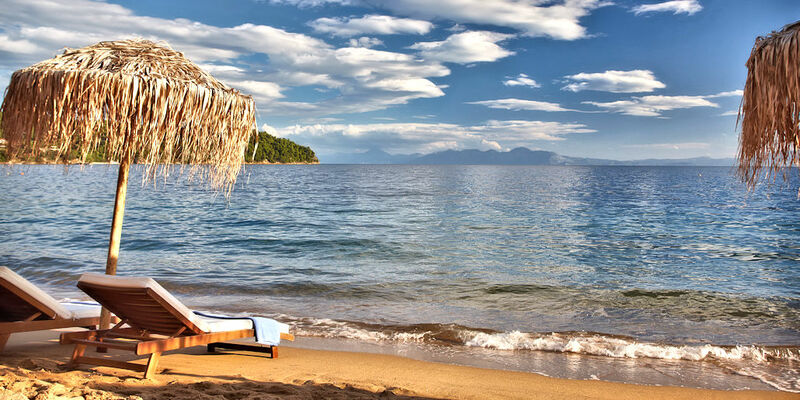 Enjoy traditional Greek hospitality, stunning views and a relaxed atmosphere in this fabulous boutique style hotel. Ideal for families, a supervised kids club and a variety of sporting activities are run, ensuring guests are entertained throughout their stay. Renowned for its unspoilt beauty, this small island offers something for everyone with fabulous beaches, enchanting hilltop towns and numerous walking trails for visitors to explore. Enjoying a secluded location, this luxury hotel offers an idyllic setting for families to enjoy. The hotel features stylishly designed guest rooms, high quality facilities and a beachfront restaurant offering beautiful views over the brilliantly blue waters of the Mediterranean. The language spoken in Skiathos and Alonissos is Greek and the Euro is the accepted currency. The number of inhabitants on Skiathos is approximately 6,000 and 3,000 on Alonissos. On Skiathos you can find delicious Mediterranean cuisine in the variety of traditional tavernas and luxury gourmet dining restaurants located on the island. Skiathos is known for its Amygdalota, chewy cookie type biscuits made with almonds. 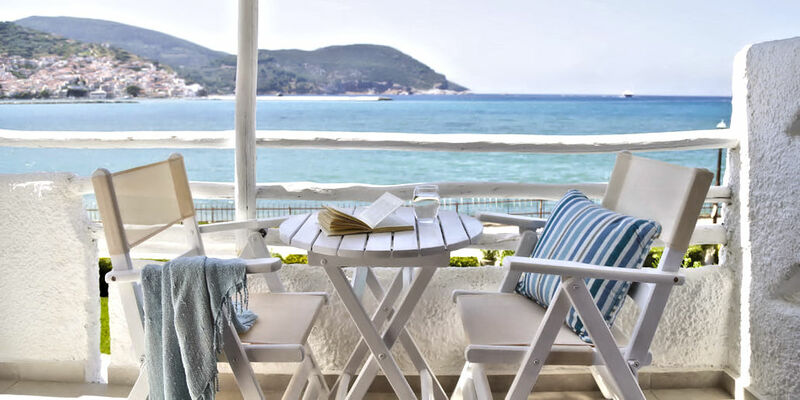 Famed for its traditional Greek cuisine, restaurants and tavernas on Alonissos serve the flavours of the Mediterranean, making the most of the fabulous fresh fish caught off the coast. Skiathos Town: Experience Skiathos Town, during the day explore its range of restaurants, traditional tavernas and quirky shops, and in the evening lose yourself in the lively entertainment options found in the bars and nightclubs. Beautiful Beaches: For golden sand, brilliantly blue waters and a tranquil atmosphere journey to Tsougrias Beach. Try out a range of water sporting activites and boat excursions. Water sports can be found on many of the islands beaches including Vassilias beach and Achladies beach, or take a boat tour and see stunning areas that can’t be reached by land. Moni Evangelistrias, Skiathos: Churches and monasteries symbolise the island’s rich religious history, many of which are scattered over the island, such as the Moni Evangelistrias. National Marine Park of Alonissos: Located at the southern end of the island, including nearby islands and rocky outcrops, the marine park is home to a wide variety of marine life including, birds, fish, reptiles and mammals. This park is the largest of its kind in Europe and visitors can swim in crystal clear waters and inspect the wide variety of fish that inhabit the area. Agios Dimitrios Beach: This quiet beach offers stunning views and plenty of space to relax and soak up the glorious Mediterranean sun. With schools of fish swimming close by in the warm, azure waters, the area is perfect for snorkelling. Boat Tours: With numerous caves carved into the cliffs, there is plenty to explore. The Blue Cove of Alonissos provides an impressive location to visit, with the clear waters enticing visitors to swim and to dive inside. 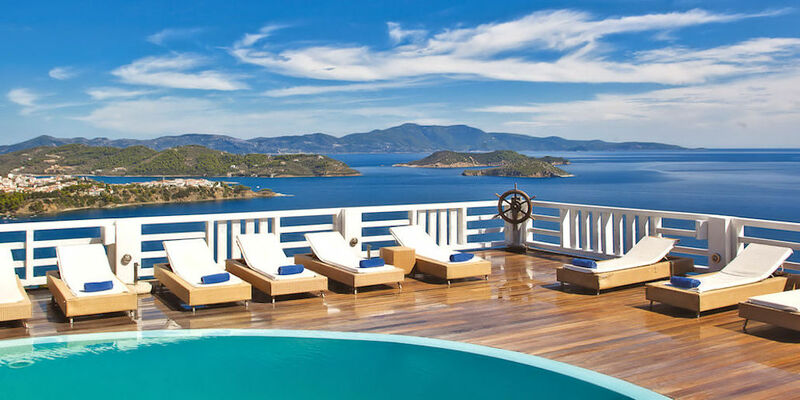 Stylish and chic, in a wonderful beachfront setting, begin your Skiathos to Skopelos island hopping holiday at the Skiathos Princess. Enjoy some downtime on the sundeck, sinking into the cushioned sun loungers by the pool with a chilled G & T in hand, or find your spot for the afternoon on the blue flag beach, just footsteps away. 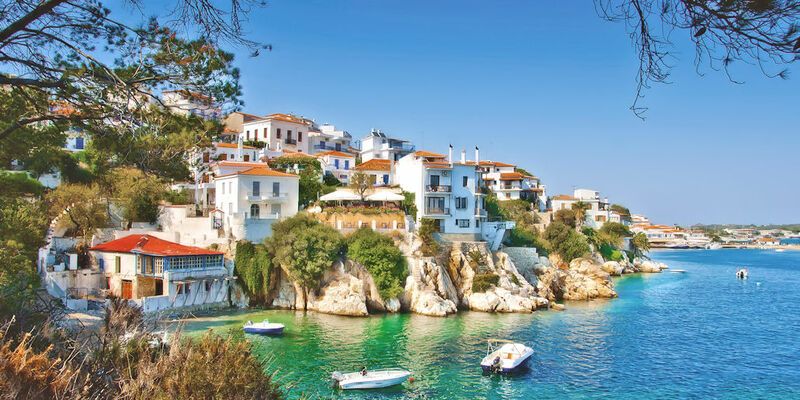 Once you have had time to recharge, it is time to escape the hotel and explore Skiathos, famed for its rich culture and religious history, the island holds a myriad of attractions waiting for you to explore. Your next island, Skopelos, is mesmerisingly pretty and known for its aphrodisiac wine, olive oil and Mama Mia! 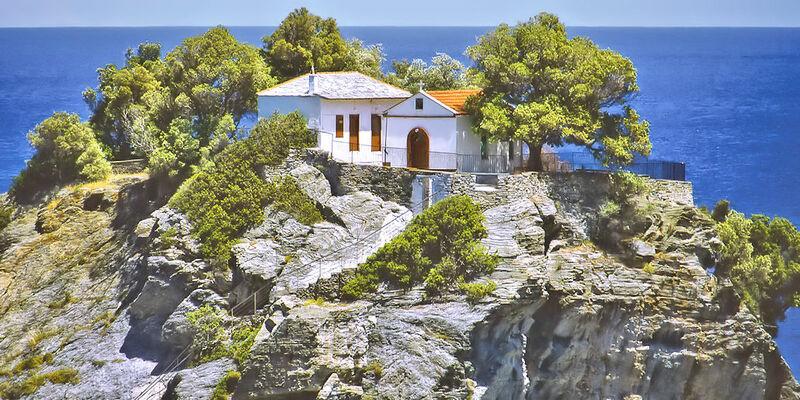 With long sunny days and spectacular views, the island is perfect for discovering by car, explore the island and pick out the film’s most famous locations such as the Church of Agios Ioannis Kastri, the tiny church atop those winding steps and, Amarantos Cape, the film’s extraordinary scenic 3 trees location. 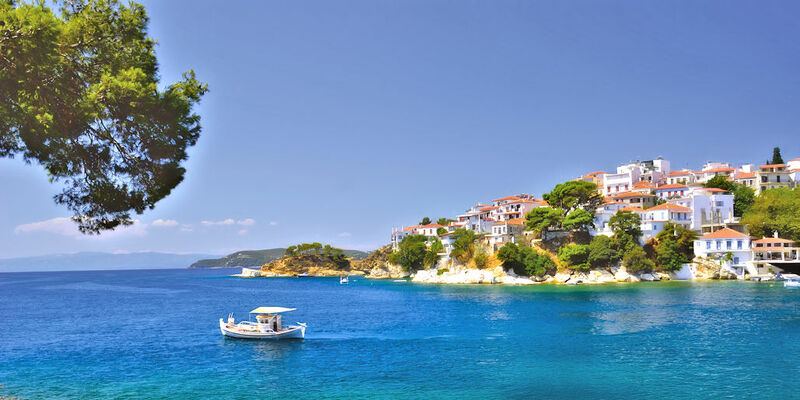 Easily explored by bus or by boat, Skiathos boasts breath taking views, crystal clear waters and a variety of churches and monasteries dating back to the Byzantine and Venetian periods. Set in vast landscaped gardens, this hotel appeals to both couples and families alike, the hotel includes a variety of state of the art facilities and high quality services, including a kids club and spa and wellness centre, to ensure guests of all ages are entertained throughout their stay. Known for its stunning views, abundance of sunshine and traditional atmosphere, the island regularly comes alive with the variety of celebrations and festivals that take place in honour of their saints. Located in Skopelos Town, this hotel offers an ideal base for those who wish to explore this beautiful town. Receive a refreshing afternoon cocktail as you relax beside the pool, and gaze over the glistening waters as you indulge in delicious culinary creations at the a la carte, seafront restaurant. The language spoken in Skiathos and Skopelos is Greek and Euro is the accepted currency. The number of inhabitants on Skiathos is approximately 6,000 and 5,000 on Skopelos. Delicious Mediterranean cuisine awaits your arrival on Skiathos. With a variety of traditional tavernas and luxury gourmet dining restaurants located on the island, visitors are spoilt for choice in where to dine out. Famed for its pies and pastries, the island of Skopelos prioritises the use of fresh, local ingredients to infuse the flavour of the Mediterranean into its pies and local dishes. Skiathos Town: Explore Skiathos Town, a range of restaurants, traditional tavernas and quirky shops await those who visit, and when the sun goes down, the abundant bars and nightclubs provide fabulous night time entertainment. Beautiful Beaches: Tsougrias Beach is perfect for those searching for golden sand, brilliantly blue waters and a peaceful atmosphere. Water sports can be found on many of the islands beaches including Vassilias beach and Achladies beach, or you can take a boat tour and see stunning areas that can’t be reached by land. Moni Evangelistrias, Skiathos: A reminder of the island’s rich religious history, churches and monasteries can be found dotted all over the island, including the charming Moni Evangelistrias. Skopelos Town: Spend the day wandering around the picturesque town of Skopelos. Pass beautiful white buildings as you climb up to the Panagitsa of Pyrgos. The church’s location offers stunning views over the island. With lots of steps to climb it is best to avoid the hottest part of the day, why not visit at sunset and watch a spectacular range of colours cascading across the sky. Church of Agios Ioannis Kastri: Featured in the Mama Mia! film the church of Agios Ioannis Kastri offers a superb photo location. For a quieter alternative, journey to the end of the island to the impressive Agios Reginos Monestery. Beautiful Beaches: Visit the Agios Ioannis Beach, made famous by the film Shirley Valentine, for wonderful views of the sunset; or visit the relaxing Panormas beach for clean, crystal clear waters and a relaxing atmosphere. Sedoukia Pirate Graves: The journey to discover these hidden graves allows you to explore the quiet, natural side of the island. Gateway to the UNESCO heritage site of the sacred island of Delos and surrounded by the Aegean Sea, Mykonos is also one of the most cosmopolitan islands of the Cyclades and boasts picturesque windmills, traditional white sugar cube houses, excellent sandy beaches and a spectacular nightlife. 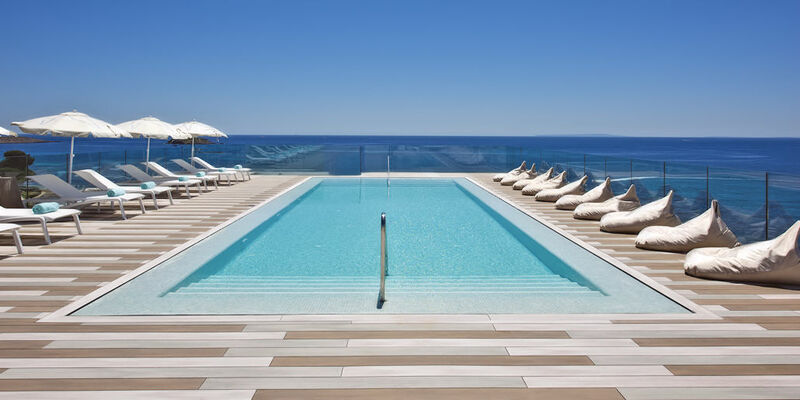 The Myconian Imperial Resort has an enticing sundeck with twin saltwater pools and the beach area below tempts with its pristine sands. 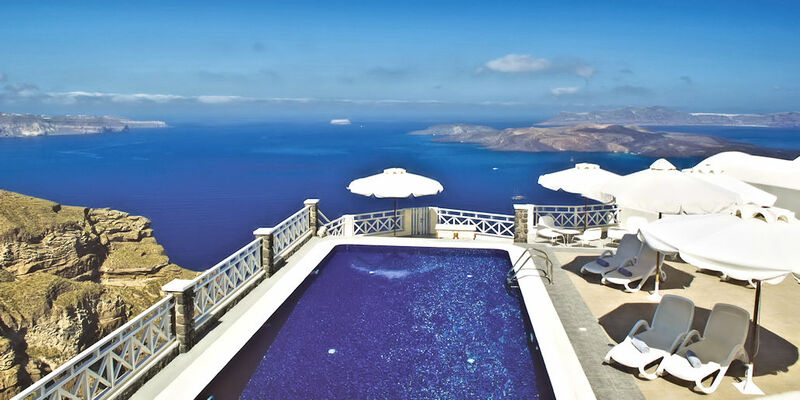 Ensuring equal luxury for your stay in Santorini, we’ve selected no other than Petit Palace. 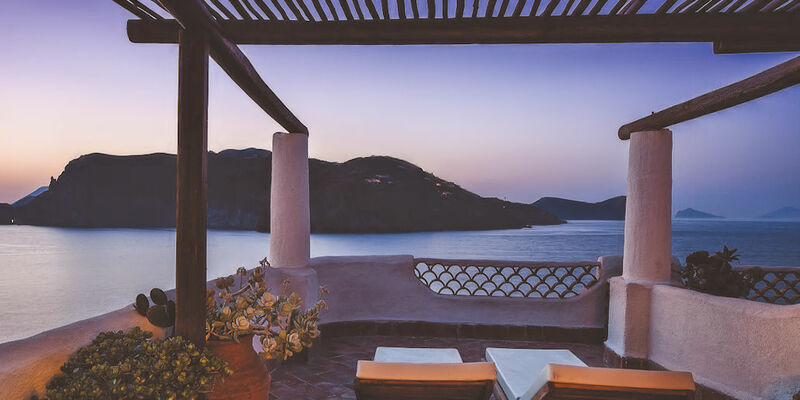 This wonderful five star boutique style hotel is a hideaway perfect for seclusion and romance, with striking views over the Caldera, insatiable cuisine and attentive service. For an exciting adventure visit the vibrant island of Mykonos. Not only the perfect location to dance the night away, but the island also offers visitors fascinating cultural excursions, delicious culinary delicacies and breath taking views. Boasting a romantic setting, a rejuvenating spa and wellness centre and a laid back atmosphere, guests are able to relax in all-round luxury during their stay. The hotel’s fabulous location also, means you are only a short ride from the unique and exhilarating nightlife for which Mykonos is well known. Famous for its white buildings and glorious blue roofs, Santorini is the ideal place to get that perfect holiday picture. Make your friends jealous with pictures of Santorini town cascading down the hillside, magical sunsets and the crystal clear waters that hug beautiful beaches. Offering stunning views over Santorini’s Caldera and the clear blue waters of the Aegean Sea, this adult only hotel is ideal for a romantic getaway, enjoying a close proximity to popular shopping locations and evening entertainment options. The language spoken in Mykonos and Santorini is Greek and Euro is the accepted currency. The number of inhabitants on Mykonos is approximately 15,000 and 25,000 on Santorini. In addition to the international range of cuisine that can be found on Mykonos, an array of delicious local, Mediterranean inspired, dishes are served in numerous restaurants and tavernas. A combinations of glorious sunshine and rich volcanic soil, provides Santorini with a fabulous range of vegetables, fruit and wine, infusing them with a unique, delicious flavour. Little Venice: For a romance filled daytrip, filled with beautiful old houses perches on the edge of the sea, Little Venice offers a romantic location to explore. The Church of Panagia Paraportiani: The oldest church on the island is well worth a visit offering superb views out over the island. Archaeological Site of Delos: For a cultural excursion take a day trip to explore the Archaeological Site of Delos. An important Panhellenic sanctuary, the island features impressive monuments, temples and mosaic artwork. Beautiful Beaches: For a vibrant location to soak up the sun, visit Paradise beach. The island’s party beach, a range of cafes and bars provide refreshing drinks. Water sports centres offer a range of activities and boat tours around the island. Nightlife: Visit one of Mykonos’ famous clubs. Throw yourself into the extraordinary nightlife which takes over the island at dusk. 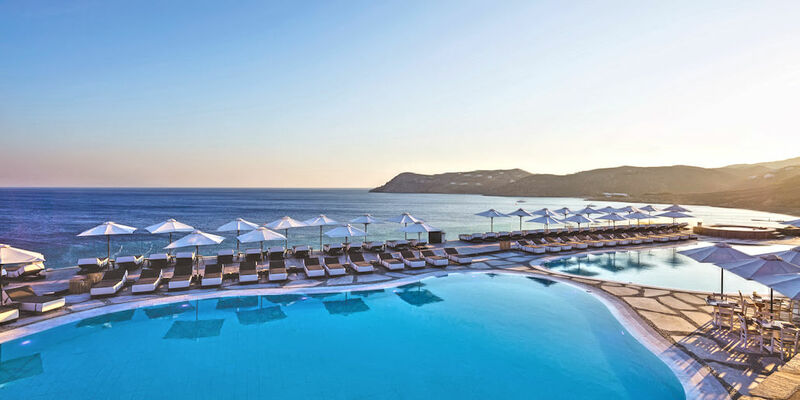 Incomparable to anywhere else, Mykonos is known for its ‘anything (and I mean anything) goes’ atmosphere, and hedonistic lifestyle, ensuring those who visit have an experience like no other. Akrotiri excavations: A Minoan bronze age settlement, the excavations create a window into the past and the lives of those who used to live there. Photography Hotspots: Take a photography tour of the island. Famous for its white buildings and glorious blue roofs, Santorini is the ideal place to get that perfect holiday picture. Make your friends jealous with pictures of Santorini town cascading down the hillside, magical sunsets and the crystal clear waters that hug beautiful beaches. Wine Tasting: Go on a winery and brewery tour and taste the unique flavour of the islands alcoholic creations. Hot Springs: For a rejuvenating experience visit a volcano and swim in the surrounding hot springs. Diving: Go scuba diving and journey into the underwater world to observe the rich biodiversity that lies hidden beneath the waves. The fine climate, splendid beaches and diverse landscapes of the Canary and Balearic Islands, attract many holidaymakers time and time again. With each island having its own special appeal, why not visit more than one, on one of our two centre island holidays, with luxury hotels selected as your base in each destination. 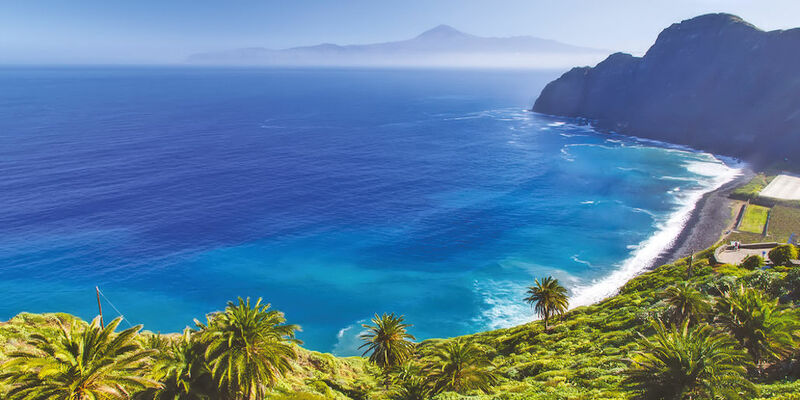 Known locally as the Isla Bonita, La Palma is truly beautiful with remarkable scenery ranging from soaring forest-covered mountains in the north, to volcanic lunar landscapes in the south, and black sandy beaches which line the Atlantic shores. 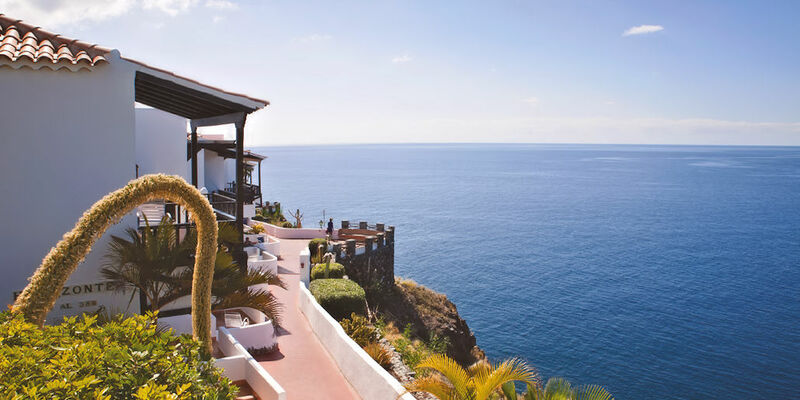 Staying at the Parador de La Palma, you’ll be surrounded by natural beauty, with stunning Atlantic Views. 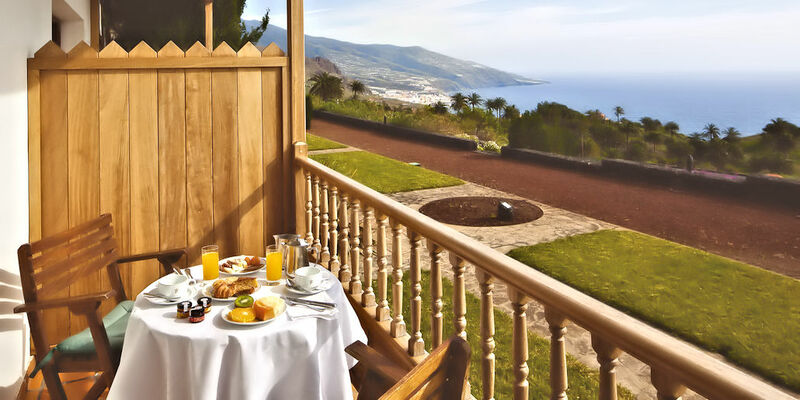 A short flight to the neighbouring canary island of La Gomera, and Jardin Tecina awaits; perched on a cliff top, this elegant four star hotel is hugely popular with Classic guests and has splendid distant views of Tenerife’s Mount Tiede; enquire about the ‘Cave for 2’ for an ultimately unique experience. Offering a lush green, mountainous landscape, La Gomera escapes the hustle and bustle of some of the other Canary Islands. From fabulous beaches and azure waters to mountain ridges and beautiful forest walks, there is plenty for visitors to explore. In extensive gardens in an area of great natural beauty, just 4km from the beach and 7km from the island’s capital, Santa Cruz, this hotel boats stunning Atlantic Views. Beautiful lush green forests and breath-taking views make this island a fantastic walking destination. Dominated by nature this elegant island avoids the crowds of the larger islands and although coach tours are available, the best way to explore this island is by foot. The Jardin Tecina offers an idyllic setting in which to relax and enjoy the subtropical climate of La Gomera. Featuring stylish guestrooms and a wealth of high quality facilities, you are free to relax in all-round luxury. The language spoken in La Palma and La Gomera is Spanish and Euro is the accepted currency. The number of inhabitants on La Palma is approximately 83,000 and 22,000 on La Gomera. With their rich soil and easy access to the vast diversity of sea life in the North Atlantic Ocean, restaurants on the islands of La Palma and La Gomera are overflowing with fresh ingredients with which to create fabulous dishes. Roque de Los Muchachos: Located above the clouds this viewpoint offers unbelievable views of the Caldera Taburiente National Park and far beyond. If you hire a car, the view is well worth the journey. 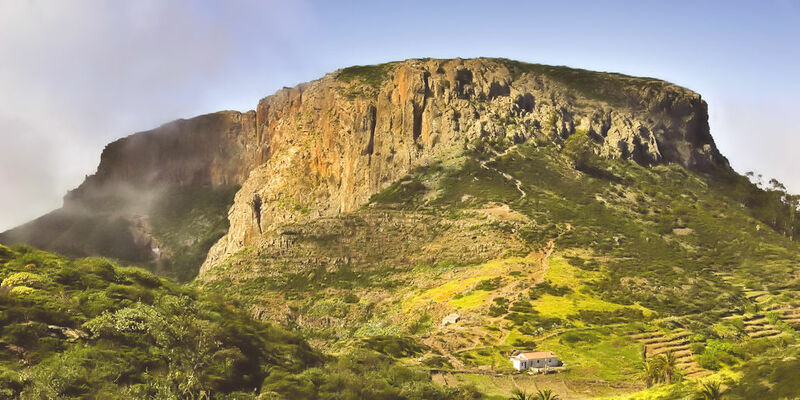 Caldera de Taburiente National Park: A paradise for walkers, this national park offers a superb range of trails to follow and spectacular views over the island. Click here for information. Beautiful Beaches: Just steps away from the hotel Parador de La Palma, Los Cancajos beach offers the ideal snorkelling location. Insular Museum: For a cultural excursion dive into the islands history with a visit to the Insular Museum of La Palma. Read our blog for more reasons to visit La Palma. Garajonay National Park: With many subtropical plant species within the densely forested area, this is a fantastic location for keen walkers to explore. 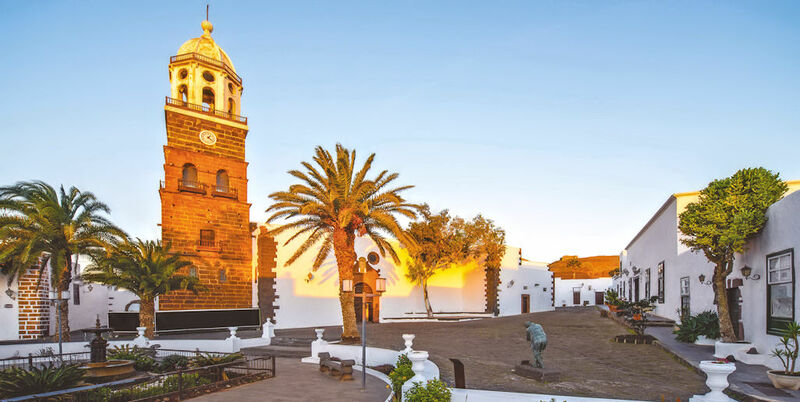 San Sebastian de La Gomera: A journey to the capital offers visitors the opportunity to view the old religious artwork in the Church of the Assumption, some of it dating back to the 16th Century. Playa de Santiago: Visit this peaceful fishing village and enjoy the lively Plaza del Carmen at the village’s centre, with its selection of bars, restaurants and sandy beach that you can sink your toes into. Silbo Gomero: Attempt to learn the whistled language, awarded the UNESCO Intangible Cultural Heritage of Humanity designation in 2009. Second in size to Tenerife and closest to the North African continent, Fuerteventura boasts a relaxed and typically Spanish way of life. Fantastic for water sports enthusiasts, the island enjoys a year-round sunny climate and a fabulous coastline of sandy beaches. A member of our Classic loyalty rewards scheme, you’ll receive £80 off your holiday to Sheraton Fuerteventura, if you’ve stayed there before. 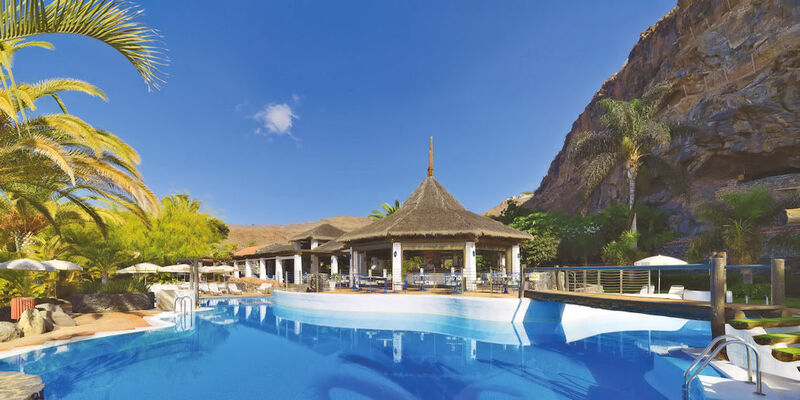 Lanzarote is the second island in your itinerary, here you’ll enjoy a prime oceanfront location, the exclusive yacht harbour and the delights of picturesque Playa Blanca, just a short stroll away; for increased privacy book an adult only Club Volcan room, where you’ll benefit from pillow and sheet menu and Balinese beds and Jacuzzi. Blessed with long stretches of soft sandy beach, traditional villages and a variety of entertainment options, the island provides a fantastic holiday destination. Enjoy your ideal holiday by sunbathing next to the ocean or visiting the popular Baku Waterpark. Offering a host of high quality facilities, this hotel works hard to make all those who visit feel at home. Ideal for families, the hotel offers a children’s pool and supervised kids club for the children, and the Hesperides Thalasso Spa and gym for the adults. Enjoying a fabulous year round sunny climate, Lanzarote is a popular holiday destination. The islands fascinating lunarscape and beautiful beaches, make Lanzarote a unique and beautiful destination to explore. 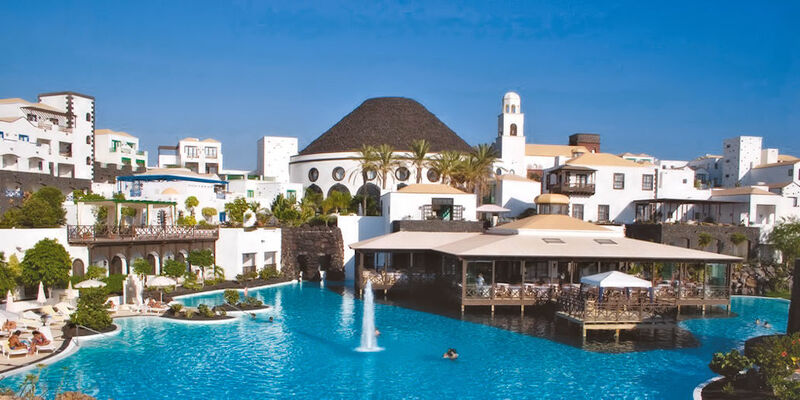 A superb location for honeymooners looking for romance as well as families wanting to spend quality time together, THe Volcan Lanzarote makes the most of its beautiful location. Its adult only Club Volcan room and children’s club aim to ensure all those who visit enjoy the holiday they were hoping for. The language spoken in Fuerteventura and Lanzarote is Spanish and Euro is the accepted currency. The number of inhabitants on Fuerteventura is approximately 116,000 and 147,000 on Lanzarote. 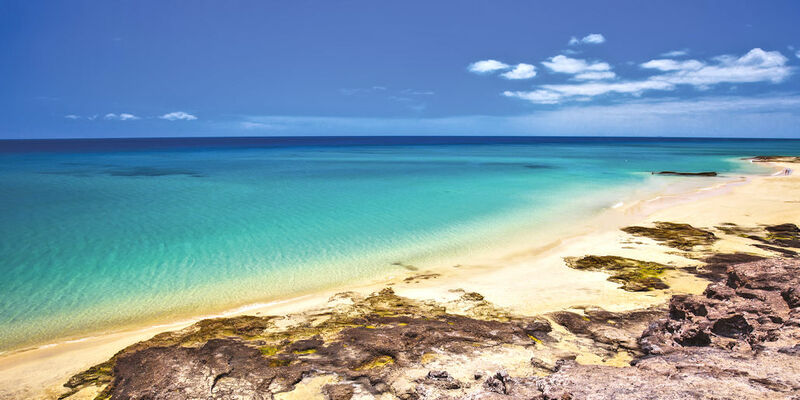 Fuerteventura and Lanzarote both enjoy culinary influences from Spain, Africa and Latin America. Although fish is readily available, including the famed Parrot Fish, the specialty on both islands is meat, for Fuerteventura goat is a local delicacy frequently enjoyed by the locals. The volcanic soils also provide a rich source of nutrients that benefit crops, giving them a rich, unique flavour. Corralejo and Lobos: Soak up the sun and relax on the glorious sand dunes. Baku Waterpark: With thrilling rides the waterpark offers endless hours of fun for all the family. Oasis Park & Zoo: View over 250 animals, go on a Camel safari and take part in the Sea Lion experience. Submarine Tours: Dive into the mysterious and exciting underwater world located just off the coast. Timanfaya National Park: Explore the amazing lunar type terrain created by the eruption of the numerous, now dormant, volcanoes. Cueva de los Verdes: Explore fascinating lava-formed tunnels with a guided tour. Water Based Excursions: Take to the water on a Catamaran and spend a day swimming and snorkelling in the crystal clear waters. Tour the Island: Visit some of the charming, old-fashioned villages, with their old cobbled streets and delightful markets. Read our blog for more things to do in Lanzarote. Thanks to Tenerife’s temperate climate it rarely dips below 17°c in winter and the trade winds provide a welcoming breeze in the summer, preventing the heat from becoming too oppressive. While the weather may be predictable, this island is a place of contrasts, with volcanic landscapes, sandy beaches and sprawling mountain scapes. 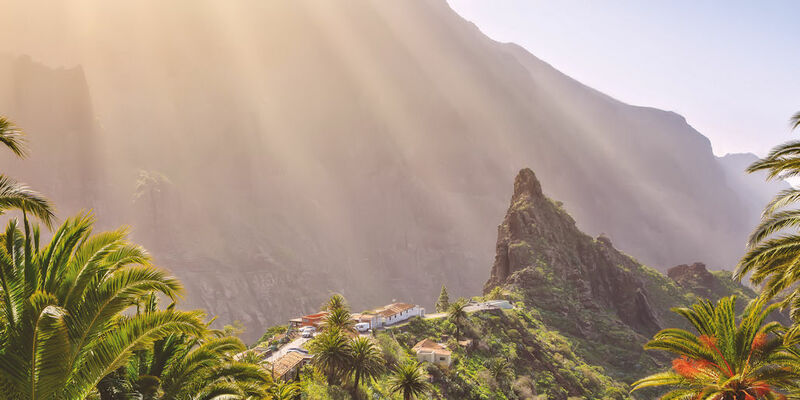 Combine La Gomera which is much smaller and quieter, with dense forestry, beautiful cedar groves and small villages scattered amongst terraced valley and most of the island is protected by UNESCO. This one has definitely sparked our wanderlust – has it yours? Located just off the coast of Africa, Tenerife is the largest of the Canary Islands. Cooling winds, contrasting landscapes and a vibrant culture, make this an appealing holiday location. 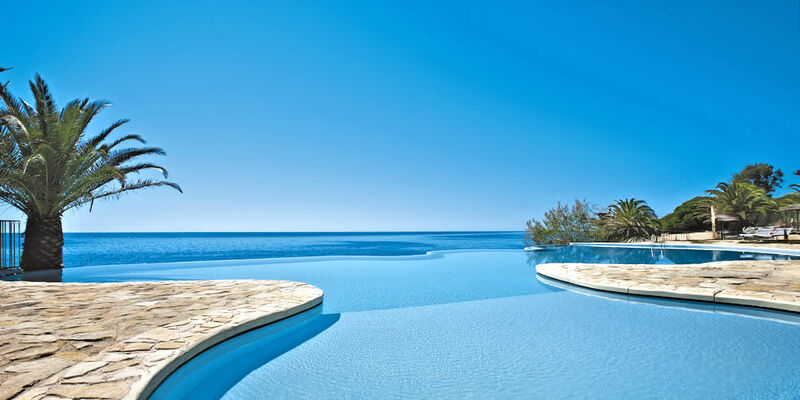 The fabulous H10 Costa Adeje Palace stands nestled into a secluded cove. Only a few steps away from a golden sandy beach, the hotel provides a comfortable and luxurious setting in which to stay. Ideal for families, this hotel offers a range of activities to keep all the family entertained throughout their stay. The beautiful island of La Gomera is saturated in an enchanting lush green forest. Avoiding the crowds of the larger islands, the dense forests and stunning views, make walking the best way to explore the island. 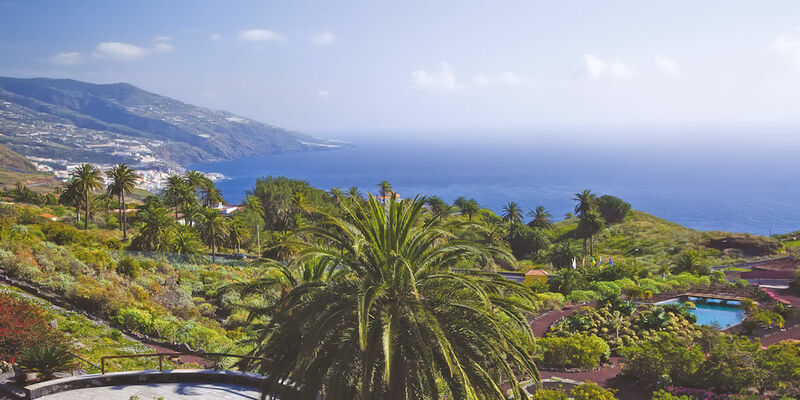 With stunning views and high quality facilities, the Jardin Tecina boasts an idyllic setting in which to relax and enjoy the subtropical climate of La Gomera. Featuring stylish guestrooms, multiple dining options and a relaxing spa centre, guests are able to relax in all-round luxury. The language spoken in Tenerife and La Gomera is Spanish and Euro is the accepted currency. The number of inhabitants on Tenerife is approximately 920,000 and 22,000 on La Gomera. Due to the island of Tenerife’s popularity, restaurants serve a varied selection of international cuisines. This means that traditional dishes may not be as easily found, however it is worth the search if you wish to try the wonderful, lively flavours of the fresh ingredients produced on the island, these include fresh fish, wild meats and tropical fruits and vegetables. La Gomera enjoys easy access to a vast diversity of sea life and benefits from rich soil for its crops. This provides the island’s local restaurants with fresh ingredients, which are used to create fabulous exotic meals. Teide National Park: This park allows you to explore the unusual lunarscape of Lanzarote. Catch a cable car to the top of Mount Teide and enjoy stunning views down the volcano and over the stark landscape below. Beautiful Beaches: With gorgeous sandy beaches ranging in colour from golden to black, your only task is to find the best beach for you. Siam Park: With something for everyone, from hair raising rides to relaxing by the pool, this water park is the ideal place for all the family to spend the day. Playa de las Americas: Throw yourself into the vibrant culture that exists within. With a range of activities available both in and out the water, along with a vibrant nightlife, there is no shortage of entertainment options. Golf: Take time away from the sightseeing and take to the golf course. With high quality courses available in stunning locations, for golf enthusiasts, there is no better place to relax and unwind. Read our blog for more things to do in Tenerife. Garajonay National Park: A vast diversity of subtropical plant species within the densely forested area, make this is a fantastic location for keen walkers to explore. San Sebastian de La Gomera: Journey to the capital and view beautiful, old religious artwork in the Church of the Assumption, with some of the artwork dating back to the 16th Century. Playa de Santiago: A peaceful fishing village, visitors can enjoy the lively Plaza del Carmen at the village’s centre, with its selection of bars, restaurants and glorious sandy beach that you can sink your toes into. The island of Mallorca is the largest of the Balearic Islands grouped in the Mediterranean Sea. Hire a car and explore the island; wander through Palma’s gothic quarter, laze on golden sand beaches or delight in mountain views, either from your car or whilst enjoying the rooftop pool at the Gran Hotel Soller. We’ve combined Mallorca with its sister island Ibiza. Both offer glorious sunshine and laid-back Spanish charm. Stay at the adults only Iberostar Santa Eulalia, set amidst lovely pine forests, yet right by the sea on one of Ibiza’s finest beaches, s’Argamassa. Perfect for relaxation, the forests provide plenty of shade for lazy afternoons, and the hotel is home to one of the most exclusive chill-out lounges on the anywhere on the island. 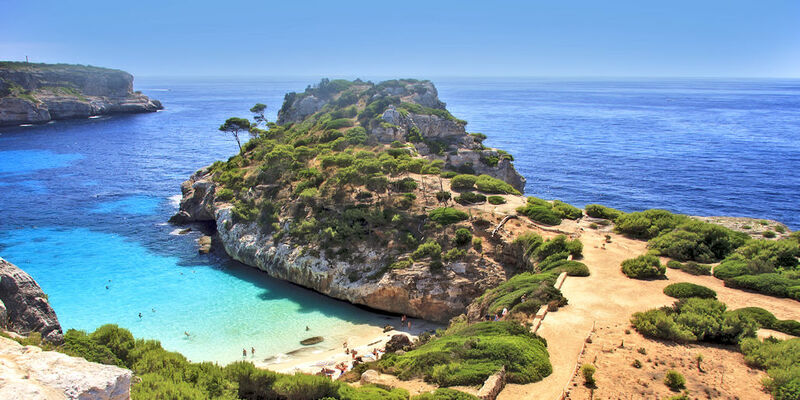 The largest of the Balearic islands, Mallorca (or Majorca) is truly captivating. Visitors can delve into the diverse culture, explore interesting historical monuments and experience the varied landscape, from fertile plains to mountain peaks. The Gran Hotel Soller provides a romantic destination in which to stay. The lavish 19th Century building charms its visitors from the first sighting. 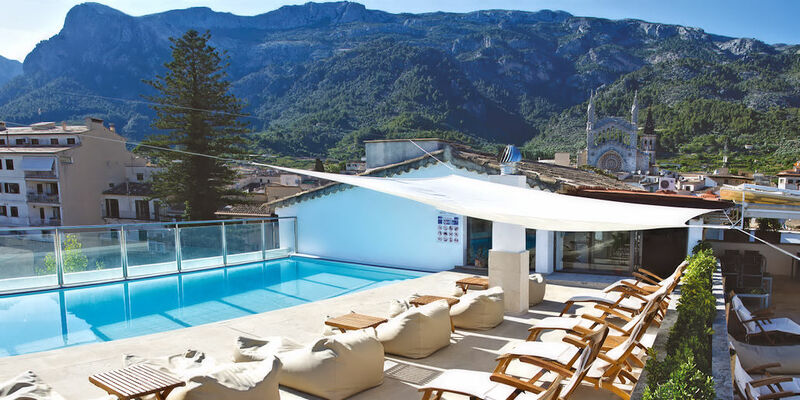 With the stunning backdrop of the Sierra de Tramuntana, enjoying a cocktail on the rooftop terrace or perusing a book from the hotel’s library, is made that much more pleasurable. Golden sunshine, rocky coastal walks and a thriving nightlife awaits those who visit the island of Ibiza. Each day the island comes alive with a variety of markets and excursion opportunities, and each night bustling restaurants and a range of bars and clubs illuminate the island. Bathe yourself in the beautiful Mediterranean sun as you relax in the tranquil surroundings of the Iberostar Santa Eulalia. This adult only hotel offers direct access to the beach, fitness facilities and spa and wellness centre. 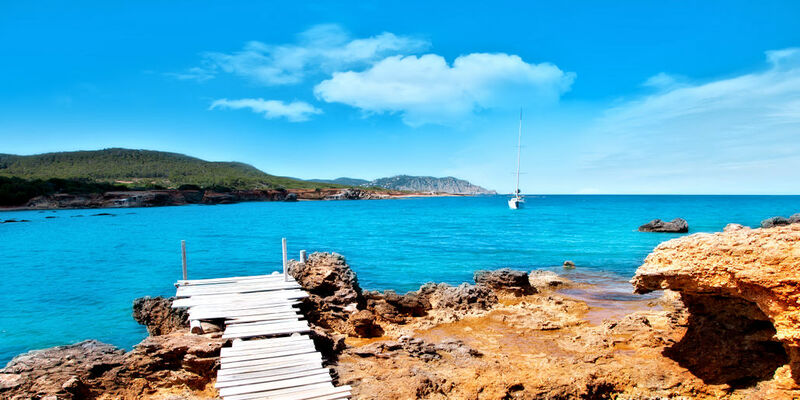 Ideal for a romantic getaway, guests can stroll hand in hand along the beautiful coastal paths on the island of Ibiza. The language spoken in Mallorca and Ibiza is Catalan (and Spanish) and Euro is the accepted currency. The number of inhabitants on Mallorca is approximately 850,000 and 150,000 on Ibiza. Delve into the Balearic gastronomic delights that can be discovered on the islands of Mallorca and Ibiza. Mallorca’s cuisine, like many other islands, has been passed down through the generations and makes use of locally sourced ingredients, including meat such as pork, freshly caught fish and locally grown vegetables. With historic influences from both the Romans and nearby Africa, plus the grounding in Spanish traditions, has led to the creation of varied, flavoursome dishes. Ibiza serves a range of culinary delights from all over the world, ensuring there is food to suite all dietary requirements. Locally sourced ingredients such as fish caught daily from the waters surrounding the island, form the basis of the culinary delights served in the island’s restaurants, with popular dishes including Paella and Tapas. Best beaches: Relax and soak up the sun on one of Mallorca’s palm lined, golden sandy beaches. Serra de Tramuntana: With areas of great natural beauty, waterfalls and charming villages to explore, this is the perfect location to enjoy the best that Mallorca has to offer. Catedral de Mallorca: This striking architectural accomplishment is well worth a visit, and for those searching for a souvenir, the area hosts a range of popular shops waiting to be explored. Take a Cooking Class: Sign up for a cooking class and learn the secrets to Spain’s most well known dishes. Caves of Drach: Take a boat tour and enjoy the live music and creative lighting that adorns the cave walls. 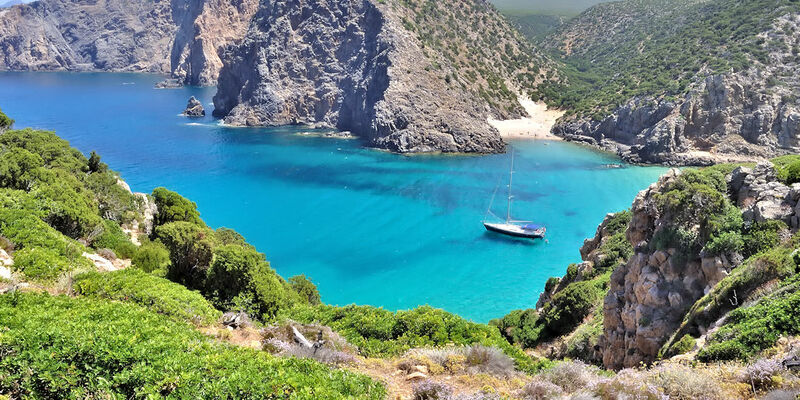 Best Beaches: For a tranquil location in which to sunbath, journey to the small, yet charming beach of Cala d’Hort. The beach offers stunning views, sand on one side and pebbles on the other, and restaurants located nearby serve a variety of culinary delights. Hippie market: Filled with an abundance of colours and fascinating items, the Hippie Market is perfect for those searching for a souvenir. Made up of countless stools fanning out under the shade of large pine trees, an array of items are on sale, from brightly coloured bikinis and flowing dresses, to hand made leather belts and henna tattoos. Ibiza Old Town: Ogle the yachts floating in the harbour in the charming Ibiza Town. Spend the day exploring the wealth of small, attractive shops, ideal for those looking for elegant dresses, hand crafted shoes and stylish jewellery, and dine outside in the sun at one of the superb restaurants in the area. Ibiza Cathedral: Journey up the hill from Ibiza Town to the picturesque Ibiza Cathedral. Adorned with beautiful religious paintings, the location offers superb views over the town and harbour below. Ibiza nightlife: What Ibiza is known for, dance the night away in one of Ibiza’s famous nightclubs and feel the rejuvenating effect that the energy and vibrancy of the island has on you. With over 450 islands, Italy provides the perfect location for island hopping. An abundance of golden sunshine, fresh mouth-watering cuisine and unique island landscapes, make the Italian islands the perfect holiday location. Here’s our top pick for you to begin your Italian island hopping adventures. Sicily is the largest island in the Mediterranean and boasts a fascinating history. Invasion by Greeks, Romans and Arabs has resulted in a unique blend of cultures, and experiences here (music, the arts, food and architecture), may differ from those of mainland Italy. We recommend the 3.5 hour journey, we’ll take care of the ferry and private taxi booking, to Vulcano Island, where you can experience therapeutic mud baths, hot springs and the tranquillity of Therasia Resort Sea & Spa; its two glorious infinity pools, and location right by the water’s edge on Vulcano island, will leave an imprint of the mesmerising views on your mind, as you gaze out over the Aeolian archipelago. With an abundance of historical monuments, secluded coves and superb towns and cities, this warm, welcoming island provides the ideal holiday location. With the backdrop of Mount Etna, guests can indulge in a variety of culinary delicacies while looking out over the Mediterranean Sea. With individually designed guestrooms, stunning views of Mount Etna and a wonderful tranquil atmosphere, the Hotel Villa Sonia provides easy access to the fabulous hilltop town of Taormina. A highly personalised service aims to ensure all those who visit enjoy the best that Sicily has to offer. 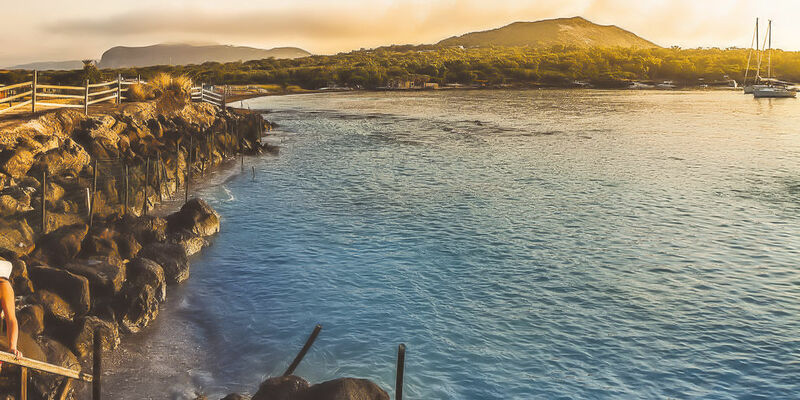 Located in the Tyrrhenian Sea, the Aeolian Island of Vulcano, offers rejuvenating hot springs to swim in and fantastic black volcanic sand beaches on which to soak up the warm Mediterranean sunshine. 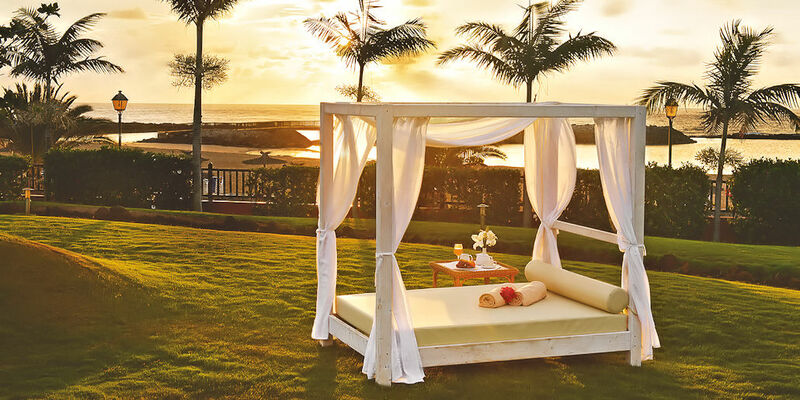 An ideal honeymoon spot, the Therasia Resort Sea & Spa offers truly luxurious accommodation in which to stay. Located on the water’s edge on the Island of Vulcano, guests can enjoy the ultimate romantic evening dining at the Michelin Star restaurant, Il Cappero, which serves a range of spectacular culinary delicacies and offers enchanting views. The language spoken on the island of Sicily and Vulcano Island is Italian and Euro is the accepted currency. The number of inhabitants on Sicily is approximately 5 million and 500 on Vulcano Island. Sicilian cuisine has a myriad of influences which have accumulated throughout its history. However, the main influence believe it or not, is Italian cuisine. Its proximity to the Italian mainland has meant the fresh flavours that embody Italy, are infused in each dish. Cuisine on Vulcano island, as one of the Aeolian islands, originates mainly from old fishing traditions and enjoys ancient Greek influences. Combining strong, colourful flavours from aromatic herbs and flavoursome vegetables benefiting from the strong sunshine, the dishes show off the diverse selection of fish that can be found in the surrounding waters. 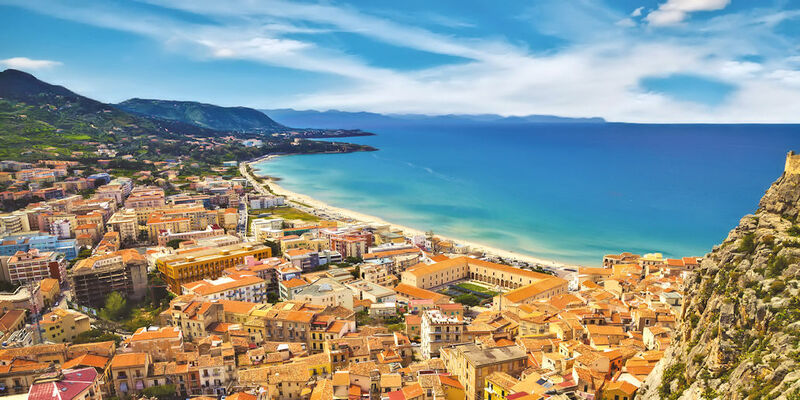 Palermo: Visit the regional capital Palermo, with influences from its long history, the town is filled with beautiful architecture, charming shops and a variety of cafes and restaurants. Mount Etna: Climb or ascend by car, and observe up close the billowing smoke from the volcano and breath taking views down the mountain, with the curvature of the earth visible on clear days. Catania: Filled with a vibrant energy, the flourishing city of Catania is the perfect place to lose yourself in the chaos and explore the abundant number of cafes, bars and restaurants that populate the city. Valley of the temples: A famous historical landmark, visitors can explore multiple temples dedicated to the gods, along with the lush gardens located within the temples. Capo Grillo: Enjoy stunning views over the coast and out to the neighbouring island of Lipari. Spiaggia Sabbia Nera: Sink your toes into the black volcanic sand found on Spiaggia Sabbia Nera. Located on the northern end of the island, just a short walk beyond the mud pools found on the western side of the island, this is a rare sandy beach that can be found on the Aeolian islands. The Central Muds of Vulcano: Throw yourself into a warm mud bath. Although the smell leaves much to be desired, the mystical healing properties believed to be in the hot spring mud baths can benefit your skin and help heal other bodily ailments. Volcano Excursions: For stunning views inside the crater of a volcano and out over the island hike up the islands dominating volcano. Underground, bubbling thermal springs, perfect for revitalising and nourishing both body and mind, are a feature of, and testament to, Ischia’s volcanic origins. The island also boasts fine, sandy beaches. Staying at the Grand Excelsior Terme, allows you wonderful views of the Bay of Naples. Combine a stay in Ischia with time on the beautiful sister island of Capri, reached by Hydrofoil in about an hour. The town of Capri is famous for its sophistication. Here boutiques and cafes surround the Italian piazza’s, delightful distractions for a lazy afternoon. We recommend Pulalli; take the steps to the clocktower in the Piazza and you’ll discover this gem of a wine bar and restaurant, perfect for combining authentic pasta and people watching. 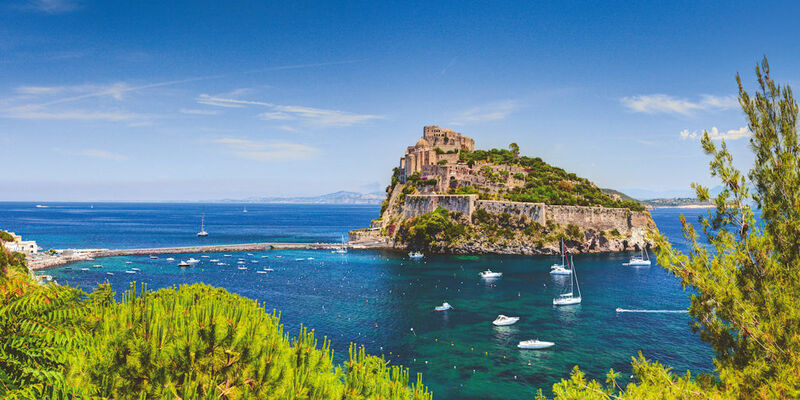 Boasting mineral rich thermal waters that are said to nourishing both body and mind, soft sandy beaches and spectacular views over the Mediterranean Sea, the island of Ischia provides a superb holiday destination. Set amongst fragrant pinewoods, the Grand Hotel Excelsior appeals to both families and couples alike. Featuring a charming elegance, the hotel boasts indoor and outdoor pools, a range of therapeutic treatments in its spa and wellness centre, and superb shopping areas only a short walk away. Offering stunning views over the Gulf of Naples, a range of delightful cafes, boutique shops and gourmet dining options, the island provides everything you need for a truly luxurious holiday. With frequent public transport allowing the island to be easily navigated and explored. 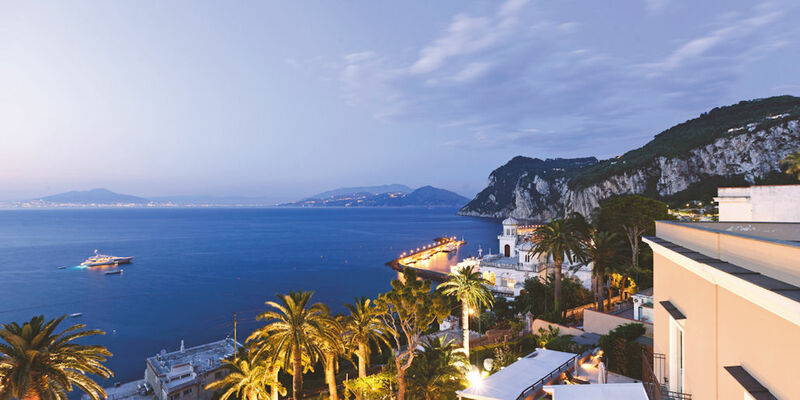 Enjoy a truly luxurious experience in the Villa Marina Capri Hotel & Spa. Promoting a relaxed laidback atmosphere, the hotel combines style with comfort to ensure guests are surrounded by all round comfort during their stay. 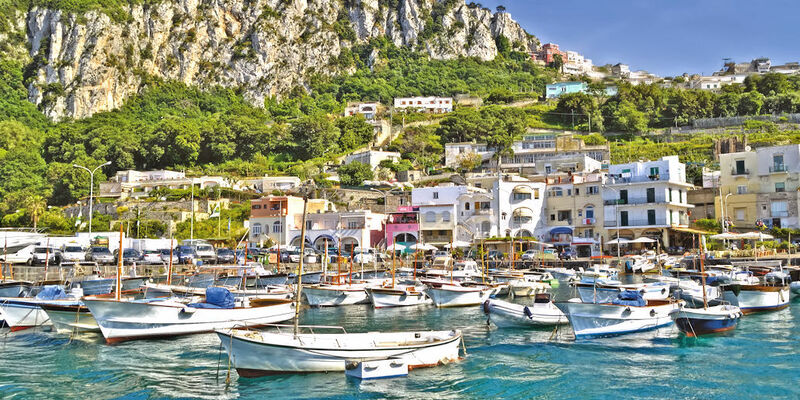 Once relaxed, guests can venture out to the town of Capri and explore the famed Piazzetta with its shops, bars and restaurants. The language spoken on the island of Ischia and Capri is Italian and Euro is the accepted currency. The number of inhabitants on Ischia is approximately 58,000 and 12,500 on Capri. Cuisine on the islands of Ischia and Capri are heavily influenced by their past. Historically the islands contained poor inhabitants, who relied on fishing and agriculture as their main source of income. The culinary delights served on the islands are now much diversified, but traditional dishes still maintain the original Italian inspiration, with fish and vegetables forming the basis for many dishes. Beautifully crafted wines and Limoncello, can also be found and enjoyed on the Islands. Aragonese Castle: A spectacular castle located on an island just off the coast of Ischia. Guests can access the island and explore the extensive castle by crossing the stone bridge that connects the island to mainland Ischia. La Mortella: A subtropical and Mediterranean garden, where visitors can enjoy stunning views and a fantastic selection of flowers, encompassed within a peaceful and serene environment. Parco Thermale Castiglione: Visit the range of thermal baths, dip into the varying temperature pools and relax, soaking up the golden sun. 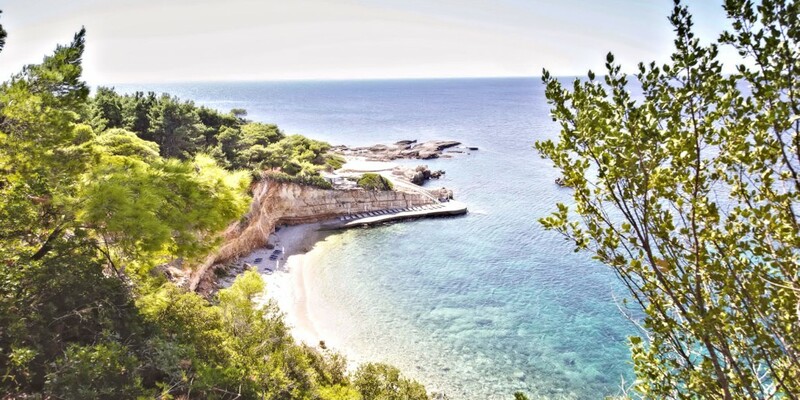 Beautiful Beaches: If you wish to explore beyond the hotel’s beach, take a trip to the beautiful San Pietro Beach. This beach is perfect for feeling the soft sand between your toes as you wander along next to the crystal clear waters of the Mediterranean. Marina Piccola: For a quieter escape in a tranquil setting, visit the hideaway spot for the rich and famous. Island tour: Travel round the island visiting the intriguing grottos that are cut into the rock. Mount Vesuvius & Pompeii: Take a day trip and explore the excavated ruins of the once bustling city of Pompeii and the neighbouring Volcano. Piazzetta: Visit the famed main square of Piazzetta where you can indulge in a refreshing cocktail in the shade while surreptitiously people watching those that amble past. 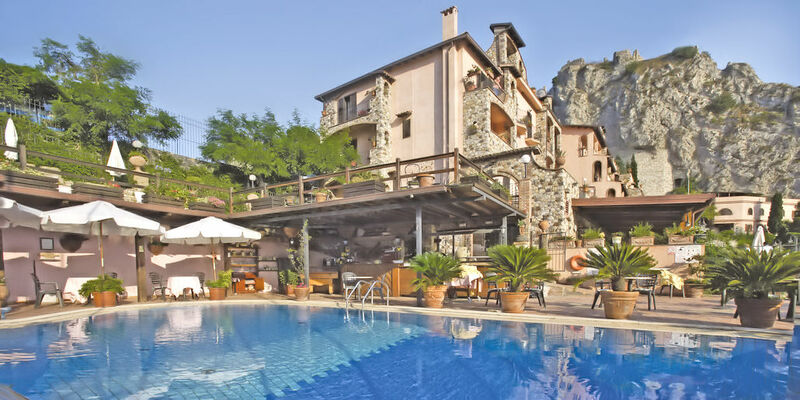 We’ve selected Hotel Villa Sonia as the perfect base in Sicily for island hopping holidays. 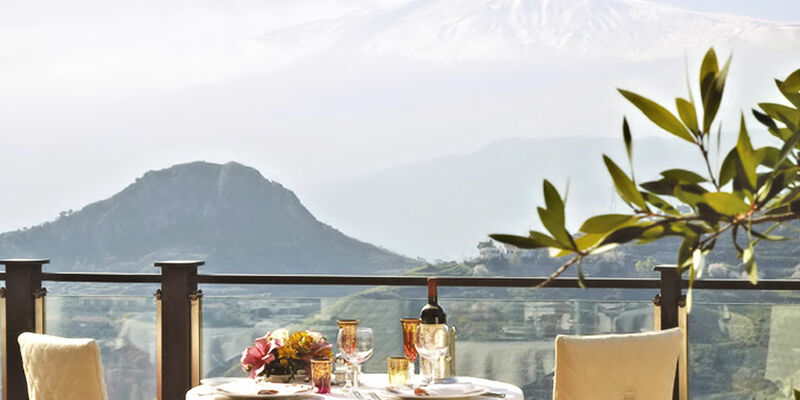 We love its genuine Sicilian hospitality; and the views of Mount Etna are sensational. 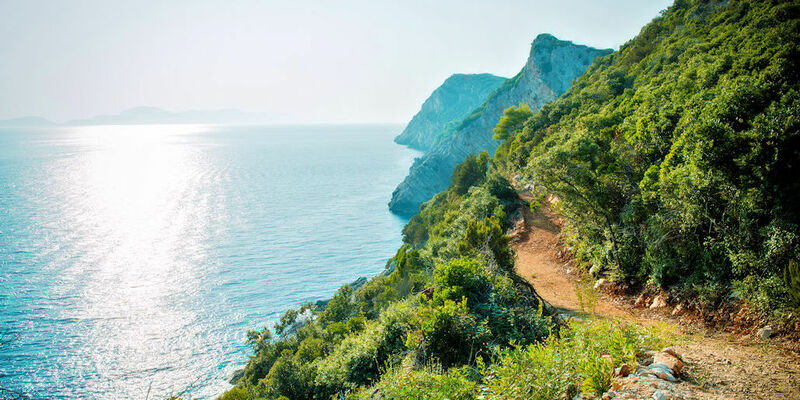 It’s easy to take the hydrofoil to Capri, or in this instance, the short flight (about 1 hour 20 minutes) to Sardinia for a relaxing beach stay. From the Hotel Costa Dei Fiori in Santa Margherita di Pula, Sardinia, it’s but a short car journey to reach the Teulada Nora beaches, some of the island’s most stunning. Promoting a welcoming, friendly atmosphere, the island boasts an abundance of historical monuments, secluded coves and superb towns and cities. With the backdrop of Mount Etna, guests can indulge in a variety of culinary delicacies while looking out over the Mediterranean Sea. With each guestroom featuring a unique design, breathtaking views of Mount Etna and a wonderful tranquil atmosphere, the Hotel Villa Sonia provides a wonderful place to stay. Providing easy access to the fabulous hilltop town of Taormina, the hotel aims to ensure all those who visit have an experience to remember. Marked with walking trails across the mountainous landscape and encompassing picturesque beaches, the island draws visitors with its rich historical past and tantalising culinary delights. 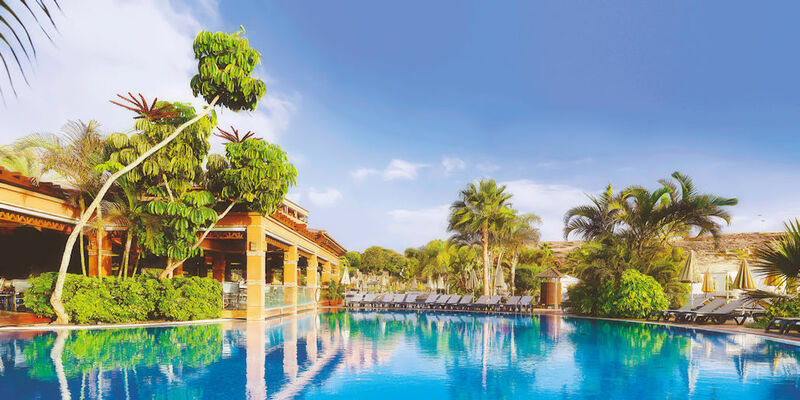 Enjoying breath taking views out over the Mediterranean, the Hotel Costa Dei Fiori offers a range of activities to entertain guests throughout out their stay, from tennis and mountain biking, to fishing and practicing your swing on the nearby golf course. Guests can also enjoy gourmet cuisine served at the hotel’s restaurant. The language spoken on the island of Sicily and Sardinia is Italian and Euro is the accepted currency. The number of inhabitants on the island of Sicily is approximately 5 million and 1.6 million on Sardinia. Boasting a myriad of influences, which have accumulated throughout its history, Sicilian cuisine offers something for everyone. Its close proximity to the Italian mainland has meant the fresh flavours that embody Italy, are infused in each dish. In Sardinia, much like in the rest of Italy, eating is a social occasion. Influenced by thousands of years of history, meals involve a variety of courses, making the most of simple yet delicious dishes aimed at nourishing those with the health of the Mediterranean diet. Palermo: The regional capital, with influences from its long history holds within, a range of beautiful architectural accomplishments, charming shops and a variety of charming cafes and restaurants. Mount Etna: Ascend the mountain and observe up close the billowing smoke from the volcano and breath taking views across the island, with the curvature of the earth visible on clear days. Catania: Filled with a vibrant energy, this flourishing city is the perfect place to explore an abundant number of cafes, bars and restaurants that populate the city. Valley of the temples: Visitors can explore temples dedicated to the gods, along with beautiful gardens which provide the ideal location in which to wander around and soak up the sunshine. 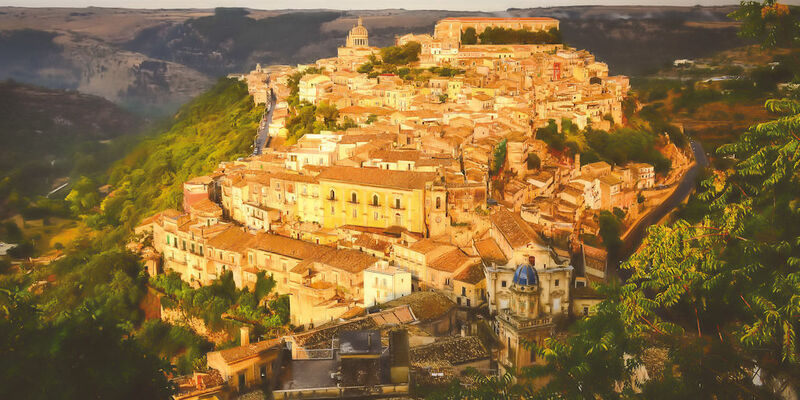 Read our blog for more things to do in Sicily. Budelli: Take a boat tour out to nearby islands, such as Budelli, and enjoy quieter beaches, crystal clear waters and plenty of areas to explore. Dolmen Luras: Go on a trek and explore the archaeological site of Dolmen Luras. Grotta del Bue Marino: Hop on a boat tour and visit the fascinating grottos, that are half submerged by crystal clear waters. Basilica di Sant’Antioco di Bisarcio: Visit this striking basilica, guided tours can be taken to learn more about the fascinating history of the churches on the island. Croatia’s coastline is a thing of beauty. With our Croatian island hopping holidays, you can discover it. With stark blue, clear waters, verdant shores and quaint medieval towns, it’s here for the taking. But with over 1,000 islands, where do you begin? 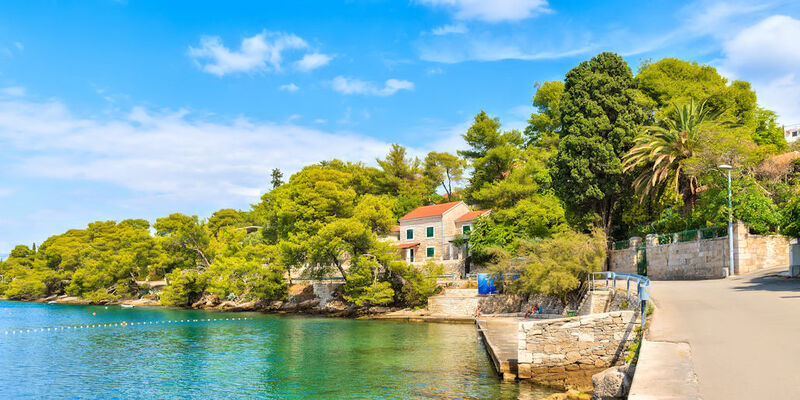 We’ve created some itineraries, which we think’s a very good place to start, including possibly one of the most popular island combinations, of Brac & Hvar. Sipan is the largest of the Elaphiti Islands and boasts an unspoilt lush landscape. Once favoured by the Dubrovnik aristocracy, the island is home to numerous 16th century residences as well as over 30 churches. The charming Sipanska Luca is the main town and has a harbour, sandy beach and palm lined seafront. Also, head to the east coast and wonder through Sudurad, a small, sleepy fishing village where time appears to have stood still. 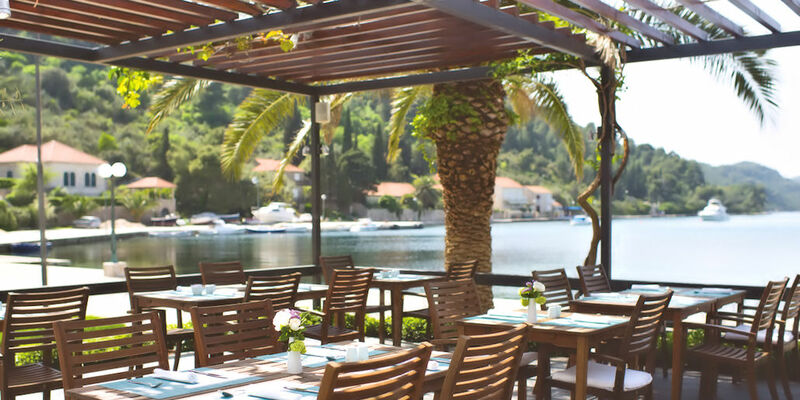 A ferry ride to the island of Korcula and onto Hotel Korcula De La Ville, set right on the seafront promenade overlooking the quay where the yachts moor up and the backdrop is the picturesque old town. 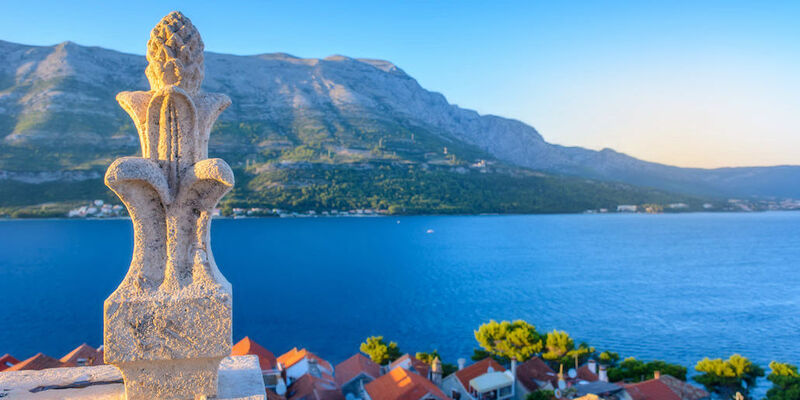 A delightful base for exploring the island, the starting point of Korcula Town, is one of the Adriatic coasts best preserved medieval cities, and just a 10 minute walk from the hotel. The largest of the Elaphiti islands, Sipan features a beautiful unspoilt landscape. Visitors can explore sandy beaches, magnificent 16th century residences and the bustling main town of Sipanska Luca. To see the best of the island travel by bike, foot or kayak. Situated at the end of a long bay, Hotel Sipan is surrounded by the lush Mediterranean landscape. A fabulous couples retreat, the hotel’s fabulous location offers beautiful sunset views and secluded beaches scattered along the shoreline provide the option for added privacy during your stay. Explore ancient olive groves, vineyards and dense woodland areas, on this tranquil island. Perfect for couples and families alike, quiet coves and fascinating Renaissance and Gothic architecture await to be explored. 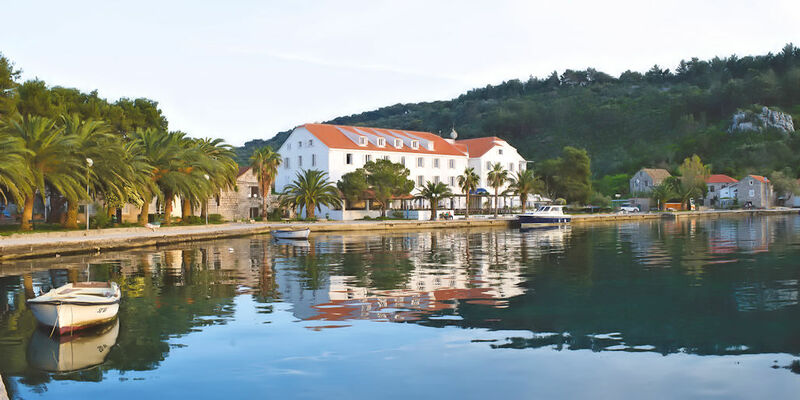 Located in the heart of Korcula, the Hotel Korcula de la Ville offers exquisite views over the Mediterranean Sea. Guests can dine at the hotel’s first class restaurant and indulge in delicious seafood dishes. (This hotel may not be suitable for those with mobility issues). The language spoken on the island of Sipan and Korcula is Croatian and Kuna is the accepted currency. 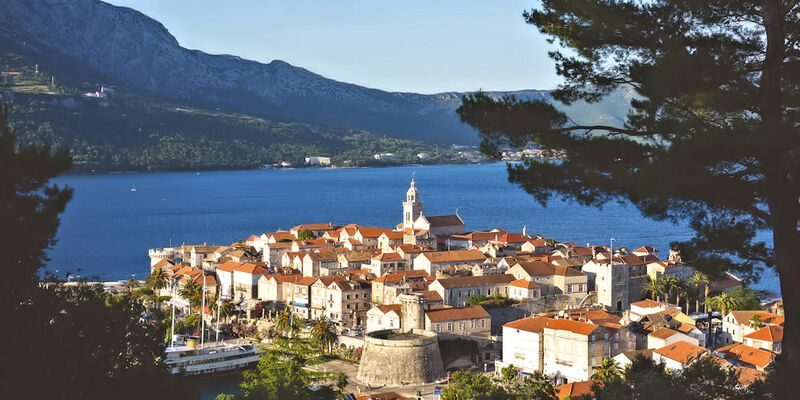 The number of inhabitants on Sipan is approximately 500 and 16,000 on Korcula. Influenced by the countries around them, cuisine served on the islands of Sipan and Korcula is varied and imaginative. Known as Dalmatian food, due the island being located along the Dalmatian coast of Croatia, the staple dishes involve fresh fish, locally grown vegetables and is seasoned with garlic, parsley and rosemary. Sudurad: One of the two inhabited locations on the island, Sudurad is a sleepy village, home to the islands main harbour and lies in the shadow of a dominating 16th century castle. St Stephens Church: From the harbour wander up to the charming St Stephens Church and enjoy beautiful views out over the bay. Hiking: Get back to nature by walking along one of the marked trails from Sipanska Luka to Sudurd. Korcula Old Town: Wander the lanes and alleyways that make up the fascinating old town of Korcula. With music in the air and historical buildings and churches to explore this is the perfect place to spend some time meandering around. Island of Proizd: Just off the western tip of Korcula, the island of Proizd offers blissful surroundings in which to relax. Crystal clear waters and beautiful views, make it well worth a visit. Get Active: A range of activities are available all over the island, both on and off the water. Go cycling and get back to nature, or explore the island by water, using a kayak to investigate hidden grottoes. With breathtaking surroundings, near a quiet, sheltered beach, and taking advantage of its convenient setting, the hotel offers half and full day excursions to Dubrovnik and its surrounding area; explore Sipan’s fields and olive groves by bike or foot, or take to a kayak and explore the island from the water. 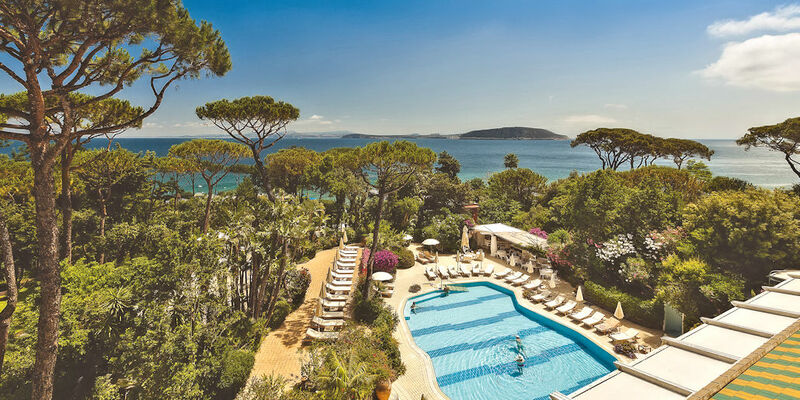 The traffic-free island of Lopud is the second part of your holiday, staying in the four star Lafodia Sea Resort with its beautiful views across the Adriatic Sea. Relax on the sandy beach of Sunj, walk the island in a half-hour stroll or take the ferry to Dubrovnik – it’s just an hour away and another opportunity to explore the the gothic town, if you missed it whilst in Sipan. Filled with olive groves and fields, the island of Sipan offers a fantastic place to relax. With a variety of islands close by to explore and the city of Dubrovnik easy to reach, there is plenty to keep visitors entertained. Hotel Sipan is surrounded by the lush Mediterranean landscape and is located at the end of a long bay. Ideal for couples, guests can enjoy a romantic meal while watching the sunset, and a variety of secluded beaches scattered along the shoreline offer the option for added privacy while soaking up the sun. The peaceful traffic free island of Lopud features beautiful beaches, traditional villages and breath taking views. Soak up the sun on a beach, walk the length of the island in half an hour or escape to the city of Dubrovnik located on Croatia’s mainland. 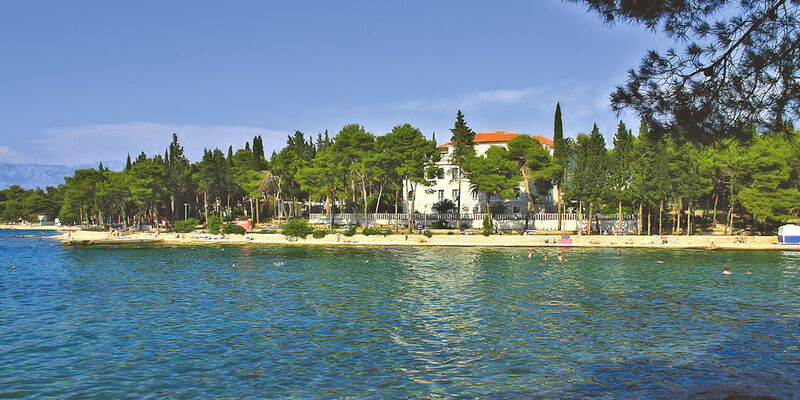 Ideal for a romantic getaway, the Lafodia Sea Resort stands encircled by the Adriatic Sea and exotic palm trees. Located on a traffic free island, guests enjoy a tranquil location in which to escape the stresses and noises of city life. The language spoken on the island of Sipan and Lopud is Croatian and Kuna is the accepted currency. The number of inhabitants on the island of Sipan is approximately 500 and 400 on Lopud. Influenced by the countries around them, cuisine served on the islands of Sipan and Lopud is varied and imaginative. Known as Dalmatian food, due to the island being located along the Dalmatian coast of Croatia, the staple dishes involve fresh fish, locally grown vegetables and is seasoned with garlic, parsley and rosemary. Sudurad: Sudurad is one of the two inhabited locations on the island, home to the islands main harbour, this sleepy seaside town lies in the shadow of a dominating 16th century castle. St Stephens Church: For wonderful views over the bay, wander up to the charming St Stephens Church, located up the hill from the harbour. Hiking: Walk along one of the marked trails from Sipanska Luka to Sudurd, and enjoy the picturesque scenery that inhabits the island. Beautiful Beaches: Only accessible by sea, Sunj Beach is a sprawling, sandy beach secluded by outcrops of land either side that make the waters of the bay calm and tranquil. Cultural Excursions: Explore some of the many churches, monasteries and religious monuments that populate the island. Get Active: A network of old trails across the island provide great hiking opportunities. Lopud Village: Wander around the village and gaze at the attractive Italian inspired villas, and take in the fresh smell of citrus that floats in the air, coming from the range of citrus trees growing in the occupants gardens. Brac (pronounced Bratj) boasts the highest peak of the Croatian islands, Vidova Gora at 778 meters and the home to Bol, with Croatia’s best known and arguably most stunning beach. 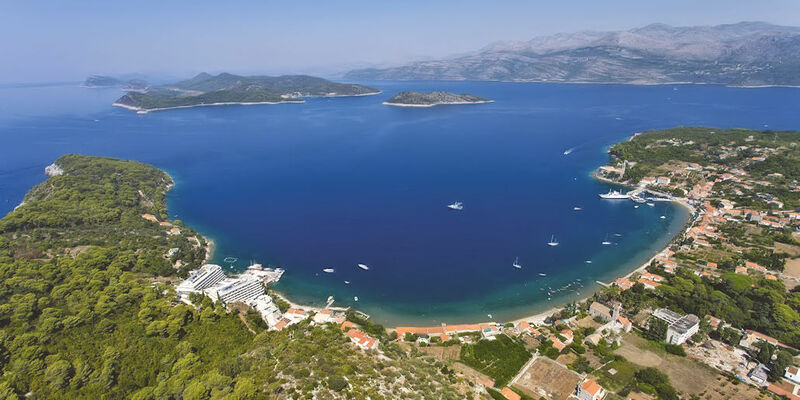 Here you’ll lose yourself in the romantic squares and the cobblestoned streets and the waterfront location in the bay of Vela Luka, with the islands longest sand and pebble beach just a few steps away, is where you’ll stay. 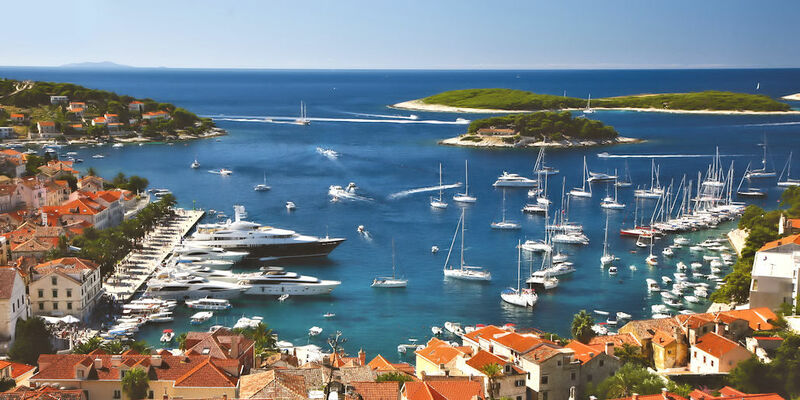 Queen of the Dalmatian Islands, beautiful Hvar is favoured by wealthy Croatians and discerning Italians whose luxury yachts anchor off the coast during the summer months. Set amidst olive trees, vineyards, rosemary and wild lavender, there are palaces and churches, and, lined with delightful cafe’s, restaurants and bars, the Riva, the central thoroughfare, leads from the picturesque harbour to 16th century Stephens’s Cathedral which dominates the main square, and up to the Fortica Fortress. Inspired? 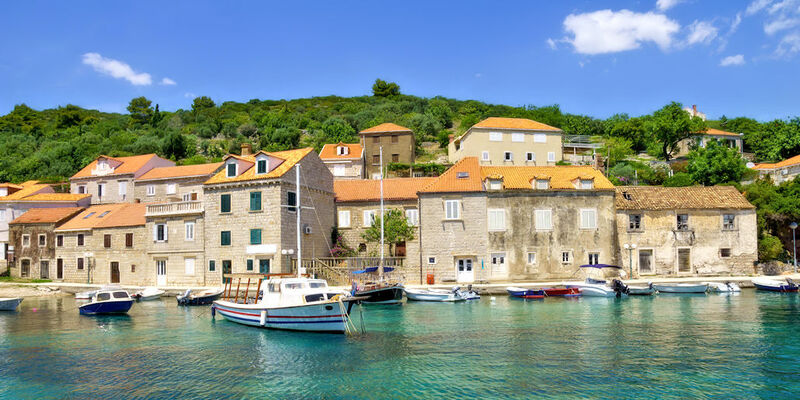 Boasting beautiful beaches, the highest peak in the Croatian islands and a host of enchanting cobbled streets to get lost in, the island of Brac provides a tranquil and romantic holiday location. Set in a superb location, the Villa Vela Luka provides the perfect base from which to explore the town of Supetar. Guests can make use of the range of facilities offered at the hotel, including relaxing treatments at the hotels spa and wellness centre, indoor and outdoor pools and a state of the art gym. A mixture of lavender fields, crystal clear waters and monuments that salute to the Islands past, combine to offer a wonderful holiday destination. Visitors can explore the city’s 13th Century walls and discover the beautiful Pakleni Islands located just off the coast. 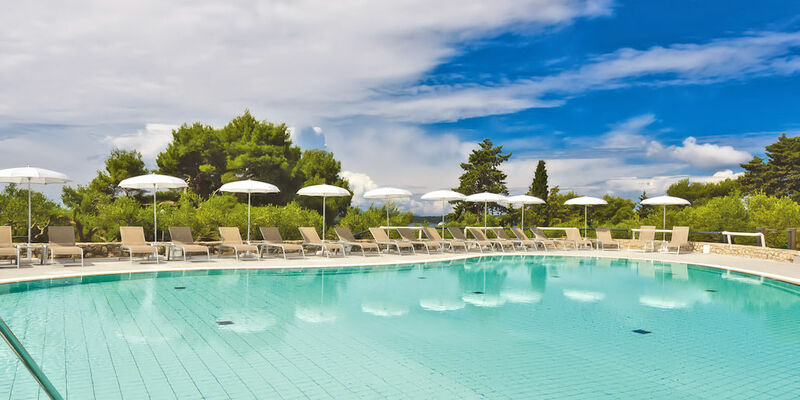 Ideal for families, the Pharos Hvar Bayhill Hotel stands surrounded by fragrant pine groves. The chic and contemporary guestrooms offer all round comfort, while the easy-going atmosphere promotes a relaxing space in which to unwind and take in the beautiful views of the area. The language spoken on the island of Brac and Hvar is Croatian and Kuna is the accepted currency. The number of inhabitants on Brac is approximately 14500 and 11500 on Hvar. Originating from Greek and Roman influences, the islands of Brac and Hvar offer a range of dishes that are popular across the Makarska Riviera region. Dishes revolve around tantalising stewed meats and fresh seafood, and as an accompaniment, visitors can indulge in locally sourced wines and beers, which convey the unique flavours of the area. Beautiful beaches: Brac island is a superb location, with many beautiful beaches to enjoy. Visit the breath taking Ziatni Rat Beach, the gorgeous blue of the water is enhanced by the small white pebbles that cover the beach. Or journey to the small town of Sumartin, where the friendly atmosphere that radiates from the village, along with the range of cafes, restaurants and bars make Sumartin Beach a wonderful location to spend the day. Blaca: For a cultural trip visit the monastery at Pustinja Blaca. Hear the fascinating history of this religious building and examine the numerous historical artefacts that offer a window back in time. Church of St. Jerolime: For a relaxing excursion visit the calming town of Sveti Jeronim. Quiet and rustic, visitors can explore the Church of St. Jerolime. Kastil Gospodnetic Dol: For superb food in a rustic setting book a table at the Kastil Gospodnetic Dol. A charming, family run restaurant, guests receive a warm welcome, delicious culinary delights and can enjoy beautiful views. Beautiful Beaches: Only accessible by sea, this rare sand beach is secluded by outcrops of land either side that make the waters of the bay calm and tranquil. Pakleni Islands: Take a boat tour and travel round the Pakleni Islands. Spend the day snorkelling in secluded coves and enjoying beautiful views of the small islands. Wine Tasting: Sample a range of tantalising Croatian wines and good food, in the main wine bar in Hvar Town, Tri Prsuta. St. Stephen’s Cathedral: Climb up the bell tower and enjoy views over the town, or sip on a refreshing drink in St. Stephen’s square and watch the cathedral glow in the last light of the day.